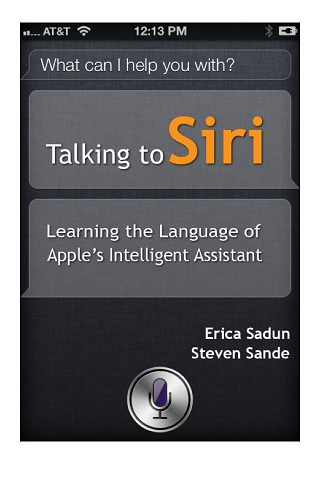 Talking to Siri, by Erica Sadun (@ericasadun) and Steven Sande (@stevensande), introduces you to Apple's Intelligent Assistant for the recently released iPhone 4S. The voice-operated assistant answers your questions, sets up meetings, takes notes, composes your text messages and a whole lot more. Erica and Steven have created this in-depth guide on how to get the most out of Siri. You'll learn the best ways to get Siri to recognize your voice, learn which commands Siri understands and learn the practical applications of the program for everyday use. After a quick read, you'll soon be able to create calendar entries, grocery lists, compose text messages and search the web for information on just about any subject. The book is a very easy read, complete with screenshots and figures to help you understand what to do and to show you what you should expect to see on your screen. It even invites you to try some of the given examples so that you can follow along with better understanding. A picture may be worth a thousand words but a practical example is worth a million! Talking to Siri is available in the Amazon book store (Kindle Edition) for only $4.99 and is worth every penny!